The Fellowship was fortunate enough to obtain a copy of DOOMSDAY.1 #2 from IDW Publishing. The art and story is by John Byrne, colors by Leonard O’Grady, and lettering by Neil Uyetake. The astronauts from the International Space Station are back on Earth trying to find food, shelter, and any other survivors amongst the devastation. When they do find people alive, they follow them to their headquarters. But heroes may regret that decision as these men are not what they seem. John Byrne has gone full circle with a new version of the Charlton comic he did the art for back in the mid-1970s. However, this version does not have the fantasy elements that were a part of the original series. While the story is good, it’s a standard post-apocalyptic story I haven’t read before. Maybe I will feel differently when the four issue mini-series is collected and I read the entire story. I’ve said in other reviews that I’ve enjoyed his artwork in the past, but it’s been more hit or miss with me on his recent projects. With that said, I enjoyed what I saw in this issue. Leonard O’Grady’s colors are more subdued compared to the first issue, but did a great job overall. 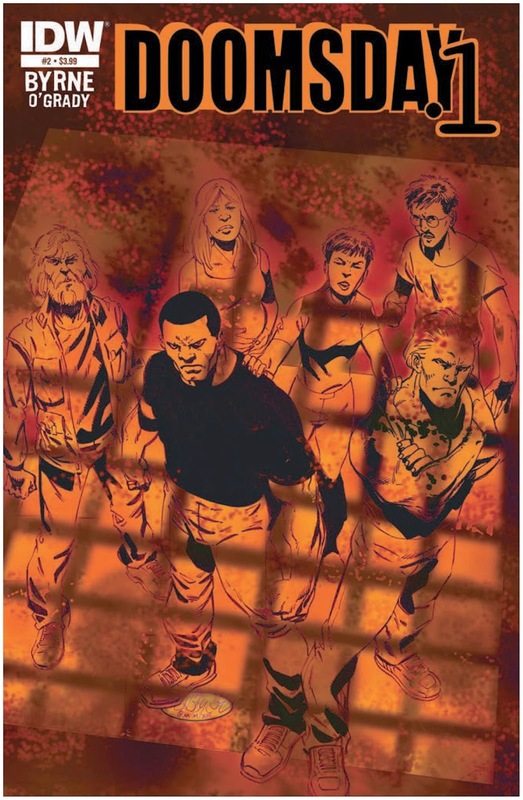 DOOMSDAY.1 #2 is stores now or available for ordering at www.IDWpublishing.com.